It comes with the same 7″ LCD screen as its predecessor (the original Nook Color). LCD screens are backlit (like those on your computer or cellphone), and aren’t as easy on the eyes or energy-efficient as the e-Ink displays used on the Kindle or Nook Classic e-readers. On the other hand, they do allow for color and video, and the “VividView” laminated, IPS, LCD display of the Nook Color (and Nook Tablet) is said to be quite good. The new name shows that B&N is positioning the Nook Tablet as more of a tablet than a reading device, as more of a multi-function device that can play videos, browse the Internet, display magazines, offer interactive children’s books, and run a small selection of specially-curated apps (like Angry Birds and some of the popular ones, but not the thousands of apps on the Apple App Store or Android Market). Being a general-purpose tablet (as opposed to a single-purpose reading device like the Nook Classic or Kindle) means it’s competing against Amazon’s new Kindle Fire ($199), as well as Apple’s larger (and more expensive) iPad 2 ($499+). The new Nook Tablet looks very similar to the original Nook Color; the changes are mostly under the hood. It comes with a faster processor and more RAM: a dual-core 1GHz Texas Instruments OMAP 4 CPU with 1GB of RAM. It sports 16GB of internal storage, plus an SD card slot for expansion. By contrast, the Kindle Fire comes with a similar dual-core 1GHz processor, but only half the memory: 512MB of RAM and 8GB of internal storage. Both devices use a 1024 x 600, 7″ LCD touchscreen. Of course, the Kindle Fire’s $199 price undercuts the Nook Tablet by $50. The Nook Tablet weighs 14.1 oz (compare to 14.6 oz for the Kindle Fire and 15.8 for the old Nook Color) and claims a battery life of 11.5 hours of reading or 9 hours of video (compared to a claimed 8 hours of reading and 7.5 hours of video on the Kindle Fire). Certainly an interesting contender in the 7″ tablet arena. On paper, the specs are a bit better than the Kindle Fire, although Amazon counters with its super-fast Silk browser and by offering to store all your media purchases in the cloud, ameliorating the lesser memory of the Fire. I think Amazon’s $50 price advantage may be the most important difference to many buyers. In any event, both $199 and $249 certainly look good when compared to the iPad 2’s $499 starting price. The image pretty much says it all, but head into a Barnes & Noble store tomorrow (Saturday, February 26) and check out B&N’s Nook Color “reader’s tablet,” and get a free cup of coffee at the B&N Cafe. 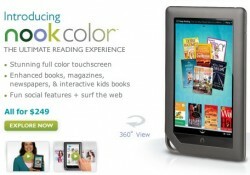 The fine print: you must visit the Nook or Nook Color counter and try a demo unit, then ask for a coffee coupon. The coupon is good on Feb 26 only, only at “B&N Cafe (serving Starbucks coffee)” locations (not Starbucks), and you get one non-customized “tall” (which means “small” in Starbucks language) coffee. The Nook Color is an Android-based tablet computer with a 7″ LCD screen. B&N markets it as a “reader’s tablet,” and it can read e-books from B&N, as well as color children’s books and magazines. It is $249. The Nook and Nook 3G are B&N’s e-Ink-based e-readers, with 6″ e-Ink screens, but they’re a generation behind Amazon’s Kindle 3. They are $149 and $199. It’s a good excuse to stop by B&N this Saturday. If you do, please leave a comment below and let me know what you thought of the Nook Color. The Nook Color: not really an e-reader, more of an iPad light. I recently got a chance to experiment with a Nook Color at a local Barnes & Noble store. As I discussed in my previous post (Nook: Color Me Disappointed), the new $249 device from B&N is a tablet computer marketed as a “reader’s tablet,” with a 7″ IPS LCD touchscreen. While this touchscreen is sharper and nicer than most LCD screens (like the one you’d find on the iPad), and boasts an anti-glare coating, I am still not sold on the idea of reading on an LCD screen; I far prefer an easy-on-the-eyes e-Ink screen. During my time with the Nook Color, I was impressed with the speed and responsiveness of the unit — a nice improvement over the original Nook with the 1.0 software, which was buggy and slow. Some features were definitely cool, like the ability to customize your “home screen” by arranging the covers of your favorite books however you’d like. Of course, certain things are better in color, like the aforementioned book covers, but where I think the Nook Color really makes some sense is as a magazine, newspaper, and children’s book reader. Magazine reading was similar to what you’d find on the iPad, except with only a 7″ screen (which, of course, helps weight and portability, but makes it tougher to see a full-size magazine page without lots of zooming in and panning around). Yes, everything is in full color and looks nice, but I just haven’t fallen in love with reading magazines on e-readers yet (mostly due to the aforementioned zooming and panning, which is annoying even on the iPad’s 9.7″ screen). On the plus side, page navigation is pretty good, with a scrollable thumbnail view of the pages along the bottom that pops up when you use it, and the “article reader” mode, which formats the text of an individual article into a single, easily-readable column with adjustable text, is a must-have feature. Unfortunately, e-magazines and other digital content (like newspapers) are crippled by publishers’ insistence on overcharging for them: while customers understand that digital distribution costs less than physical and want to buy content once and read it online, on a Nook Color, and on an iPad, publishers insist on charging separate subscriptions for print, online, and iPad or Nook Color subscriptions. Even worse, the digital subscriptions are often the same price or even more than the physical version, which must be printed and shipped. Since I don’t yet see the appeal of digital magazines and newspapers (until they get some pricing and delivery issues worked out first), and I’m not the target market for children’s books, I look at the Nook Color mainly as an e-reader. And, for that purpose, I find the Nook Color about the same as an iPad: so-so. It has a smaller screen and less battery life, but is a little less heavy and costs only half as much. But my Kindle 3 still blows it away for pure fiction reading: smaller, half the weight, much longer battery life, added 3G connectivity, $70 cheaper, and much easier on the eyes. On the other hand, as an Internet machine, the Nook Color’s LCD screen makes it far more useable than the Kindle, which doesn’t handle Internet browsing well. It also includes a couple of interesting apps, like Pandora radio, which the Kindle doesn’t have. The Internet worked pretty well on the unit I tried, with pages looking pretty good, within the confines of a 7″ screen, anyway. I certainly wouldn’t replace my 21″ monitor at home, but it works on the go. One other aspect to note: the Nook Color is a fairly powerful tablet computer than runs on the Android operating system, with a layer of B&N software over it that locks out certain Android applications and focuses it on reading. However, tech-savvy users have started rooting their Nook Colors, bypassing B&N’s software and thereby running any Android app they want, including games and even the Kindle for Android app! This means — if you’re OK with reading on an LCD screen — you could use a Nook color to read books from both B&N and Amazon (and Kobo and anyone else with an Android app). My final recommendation still is dependent on what you’re looking for: if you want an e-reader and plan to spend most of your time reading fiction novels, I can’t recommend any LCD-based tablet computer, including the Nook Color. However, if you (a) like reading on an LCD screen, (b) are really interested in magazines, newspapers, children’s books, or Internet surfing, or (c) are looking for an inexpensive Android tablet computer, the Nook Color may be worth a look, as it’s snappy and seems to function well. The Nook Color: not really an e-reader, more like an iPad Lite. Well, B&N’s big announcement today turned out to be as expected (since it was leaked a few days ago): the Nook Color, a tablet computer with a 7″ LCD touchscreen display. As I’ve said many times before (also here and here), backlit LCD screens just aren’t as good for reading as e-Ink screens: LCD screens cause more eyestrain (for most people), use much more battery power, wash out and are unreadable in sunlight, and even make it harder to fall asleep. So why use them? Well, LCD screens (like your cell phone, computer monitor, or many TV sets) display color and video, two things the current crop of e-Ink screens can’t do yet. That’s great for surfing the Internet and watching videos, but for reading books, I’d rather stare at a screen that is easy on my eyes and mimics paper, instead of my TV set. The Nook Color, which is $249 and will be available in B&N stores and online at B&N’s website starting November 19, promises more interactive e-books (such as cookbooks with color photos and videos), a whole new specialty section for children’s interactive e-books, a built-in web browser (using the Wi-Fi wireless connection), and various games and apps, including Sudoku, crossword puzzles, chess, and Pandora Internet radio to start. It will also focus more on color newspapers and magazines. It runs Android 2.1 (to be updated to 2.2), and can view Microsoft Office (Word, Excel, Powerpoint) files. 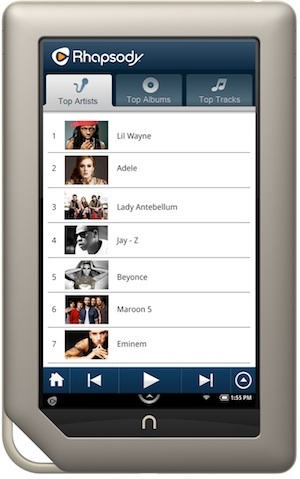 It can also view photos, and play audio and videos. It will supposedly support Flash-based web content in the 2.2 Android update. It costs $249, compared to $149 for the comparable Nook Wi-Fi or $199 for the Nook with Wi-Fi and 3G. It does not include 3G wireless connectivity (which connects to the cell phone network), and can only be connected at Wi-Fi hotspots, like you might find in some homes, offices, and coffee shops. It weighs 15.8 ounces, or just about 1 pound. Compare that to the 12 oz weight of the original Nook, the 10 oz weight of the Kindle 2, the 8.5 oz weight of the Kindle 3, or the Sony Pocket at just 5.6 oz. At almost double the weight of its main competitor, the Kindle 3, it’s closer to the 24 oz weight of the iPad, which I find too heavy for comfortable reading for any length of time. The battery life, already a weak point for the Nook as compared to the Kindle, only lasts 8 hours, even with the wireless off! (So, figure 4-6 hours using Wi-Fi to surf the Internet.) Compare that to the Kindle 3, which lasts for up to a month on a single charge. Do you see why we like e-Ink screens in our e-readers yet? I’m a bit baffled, to be honest. Compared to the K3, I think it’s a disaster. For $139, you could get a Kindle 3 that’s much less expensive, easier on the eyes, can be read in sunlight, weighs half as much, and has a battery life measured in weeks instead of hours. For $189, you get all that and throw in free-for-life 3G wireless connectivity to browse and download books almost anywhere — still $60 less expensive than the Nook Color. I think a better comparison is to the iPad. For half the price of the $499 iPad, you get a smaller (7″ screen vs. 9.7″), lighter (15.8 oz vs. 24 oz) tablet computer with less memory (8 GB vs. 16 GB, but the Nook Color does come with a Micro SD card slot, so this is about a wash). I haven’t seen the processor specs of the Nook Color yet, but I’d be surprised if it was as fast as the iPad. It runs the Android operating system instead of Apple’s iOS, and some people might prefer that, although Apple still has a strong lead in the number of apps available for its platform. I’m still a little baffled by the direction B&N is going — I thought they “got it” and understood what we readers wanted: an inexpensive, light, easy-on-the-eyes non-backlit screen with a battery that lasts forever. Instead, they seem to be chasing the “hype” of color — something non-readers have been clamoring for, claiming the iPad will “kill” the Kindle for some time now — even going so far as to make “Color” a large part of the name. It seems to me like they’ve given up on competing with the K3, and have decided to branch in a different direction instead. Well, time will tell if it’s successful, and I hope they at least keep updating the original Nook line (which is now a generation behind the Kindle 3 and is in desperate need of a refresh), so those of us who have no interest in a Nook Color tablet computer can just ignore it. But I was looking for a Nook 2, a worthy competitor to the K3 that would push the e-reader market forward. Instead, we got the iPad Lite. Color this reader disappointed.